While teaching students intermediate English, this study explores the miraculous events of the birth, life, and death of Jesus. Within the pages of Linda Good’s new book, God Loved/God Gave ($21.49, paperback, 9781545617502; $9.99, ebook, 9781545617519), readers will find a collection of 130 Bible studies and English lessons written for the student studying English at the intermediate level. 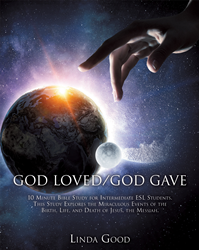 God Loved/God Gave focuses on the life of Jesus and the basics of the Christian faith, English grammar, and speech. “In this post-Christian society, our churches are in a unique position to offer English lessons while at the same time teaching about the love of God and His precious gift of forgiveness and eternal life,” says Good. Linda Good worked as a registered nurse for thirty years. She received a master's degree from Liberty University. She has taught ESL at Horizon Church for 12 years. Xulon Press, a division of Salem Media Group, is the world’s largest Christian self-publisher, with more than 12,000 titles published to date.God Loved/God Gave is available online through xulonpress.com/bookstore, amazon.com, and barnesandnoble.com.